*Note* This was posted on April’s Fools Day. Unfortunately helium is not very soluble and the moment you opened your beer it would all be released. Move over Nitrogen, Sam Adams released a new beer today, the HeliYum. HeliYum uses helium instead of Co2 or nitrogen completely changing the mouth feel. Check out the video for the details! Please note that the GrowlTap has no future plans to release a helium version. 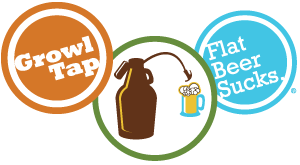 GrowlTap users continue to come up with new and creative ways to use their GrowlTap but warns that we are not responsible if your growler floats away. were can i order it ??? I wish it was actually available. A sulfur hexafluoride beer would be awesome as well. Oh come on!! 😀 can you at least have it be a seasonal special every April fools day? My friends and I would love this!! I would buy a case right now! I’m rather disappointed that people don’t get the opportunity to purchase this beer. It would be a good gag beer anyday. I also bet MY local bars would have a blast putting this behind their bar. I really would just love to know if it is or ever going to be possible to purchase this product. It’s seemingly unfair that the company would publish the beer existence yet horde all the fun to themselves! Gah! Just take my money! I really want some of this is there a way to order it? Come posso portare questa birra in Sardegna ? Is it possibile to order heliyum beer?